Depending on the configuration of your IT systems, your internal procedures, the nature of your business and other factors, Netwrix Auditor might also facilitate compliance with provisions of the HIPAA not listed above. Netwrix Auditor provides complete visibility into on-premises and cloud-based systems and applications to enable control over user actions and improve data security. This HIPAA compliance software delivers security features that empower you to conduct HIPAA risk assessments, detect anomalies in user behavior, and investigate threat patterns before they turn into security incidents or disrupt business services. 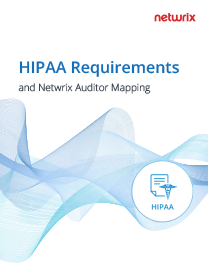 Unlike many other HIPAA audit software solutions, Netwrix Auditor provides out-of-the-box compliance reports mapped to specific requirements of HIPAA and many other common regulations, reducing the time and effort required for the compliance preparation process. 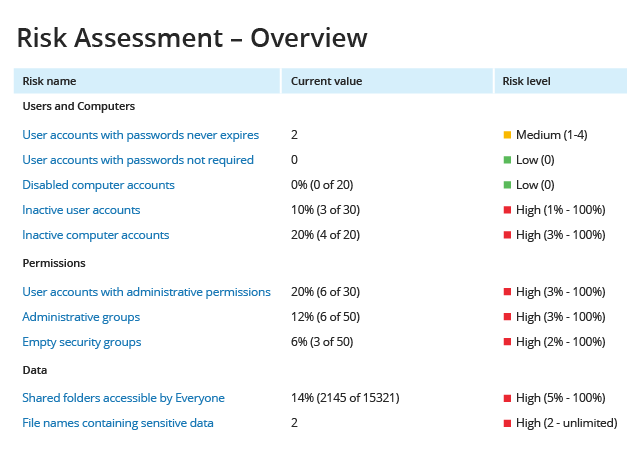 Use the IT risk assessment functionality in Netwrix Auditor to enable continuous IT risk analysis. With the resulting security intelligence, you can identify and mitigate risks in areas such as account management, security permissions and data governance. 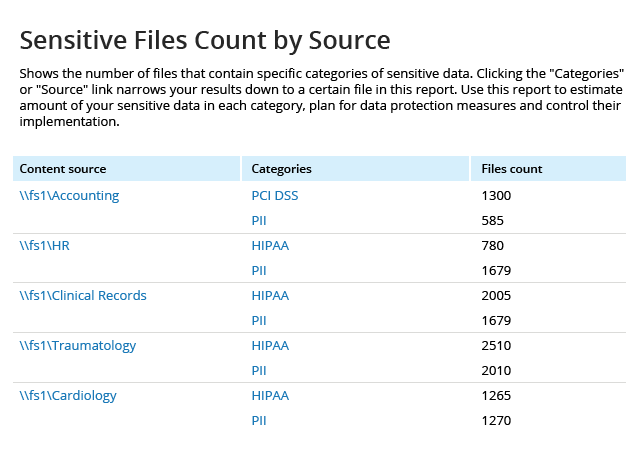 With the Data Discovery and Classification, you can get a complete picture of where your sensitive data is located and know when any sensitive files surface outside of the secure locations. Use this information to remediate risk and to identify employees who require additional training on sensitive data management rules and procedures. 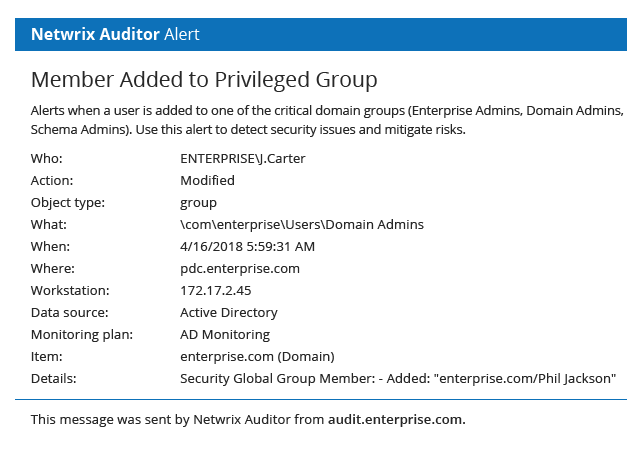 Get notified any time a user is added to a privileged group, such as Enterprise Admins or Domain Admins, so you can quickly revert any improper changes to mitigate risks to your critical resources and protected health information. 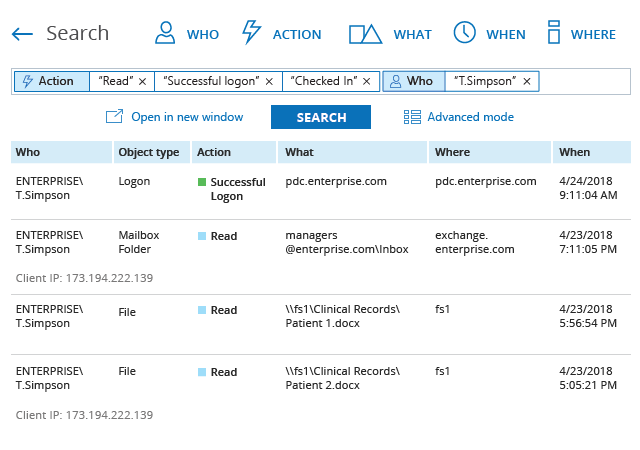 If you spot suspicious changes or data access, use the Interactive Search feature to investigate the activity before it turns into a data breach. 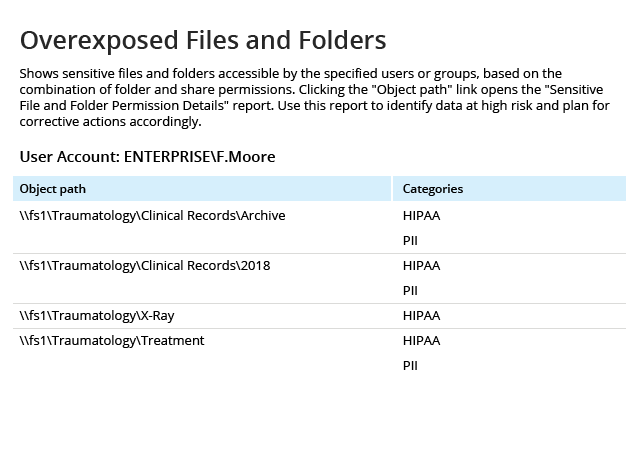 For example, if you see that one of your admins was accessing protected health records, you can easily get a list of all resources that employee accessed during a particular time period to check for other security violations. If a data breach occurs, use Data Discovery and Classification reporting to analyze which protected health information a malicious insider or a compromised account had access to, and which pieces of data were actually viewed. Use this data to contact all affected parties as prescribed in the requirement regulating breach notifications. Medical Center Clinic slashes HIPAA audit preparation from a month to just 10 days and cuts its IT team’s workload in half. on user activity monitoring and ensures it is ready to pass HIPAA audits at any time.